It would be unfair not to present the doings of our day-time guests. From September a great number of our jays have gone southwards and in their place winter guests have arrived from the north. Jays flying in a flock are a somewhat unfamiliar sight with their flopping flight. There are plenty of acorns this year in Ilmatsalu too, and the birds have collected and hidden their winter stores industriously. 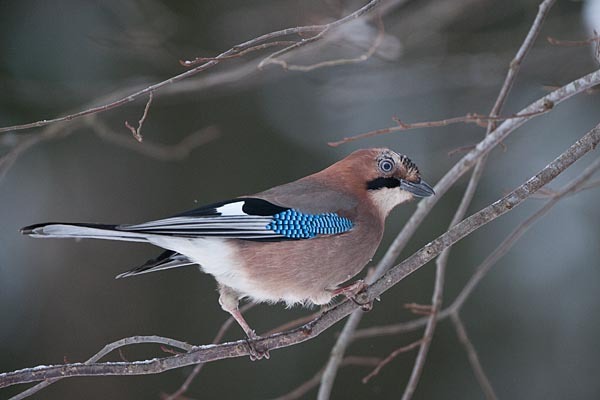 The elastic gullet of the jay can hold up to twelve acorns at best. When it rises into flight the gobbled acorns start to spill from the beak and maybe half arrive at the hiding place. 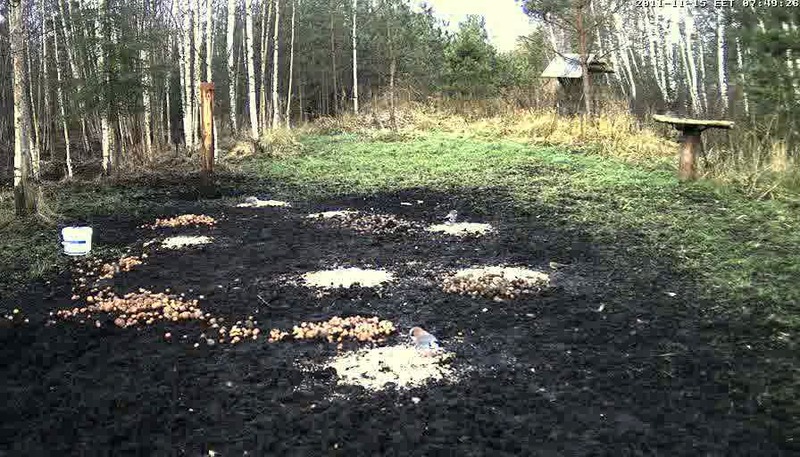 The cereal heaps on the feeding ground are treated similarly: gullet full and then away to hide the grains. Hiding places should be mouse-free areas – why create provisions for food contenders? That much shrewdness is necessary, and of course a good visual memory to find the hiding places in a changed wintery landscape. The winter number of the birds varies: from a hundred thousand to a quarter of a million. On the folded wing feathers of the jay the Estonian national colours can be seen; the body is pinkish grey, the tail base white, the tail black and long, but not quite as long as the magpie’s. In an excited mood the feathers on the crown are raised. Behaves prudently but it is not a bird that is shy of humans; it keeps to forest verges with plenty of undergrowth.